The KJV Here's Hope New Testament is perfect for evangelism and outreach, featuring the "Roman Road" plan of salvation and a special "Where to Find It" index section. 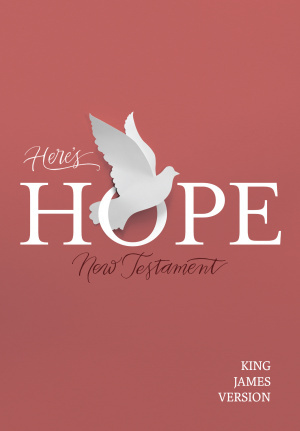 KJV Here's Hope New Testament by Holman Bible Staff Holman Bible Staff was published by Holman Bible Publishers in September 2017 and is our 3840th best seller. The ISBN for KJV Here's Hope New Testament is 9781462766208. Be the first to review KJV Here's Hope New Testament! Got a question? No problem! Just click here to ask us about KJV Here's Hope New Testament.